After completing losing our reputation as a side who like to play an attractive, possession-based style of football in our final years in the Premier League, new Swansea City manager Graham Potter vowed to get us back to the “Swansea Way” this season in the Championship. You wouldn’t expect Potter to have completely transformed us overnight and taken us back in time to vintage Swansea City in 2007-08 under Roberto Martinez but there’s already been plenty of refreshing football on display and encouraging signs that we can get back to that. It’s going to take some time, it always does. Pep Guardiola needed a full season at Manchester City before they fully clicked and Brendan Rodgers wasn’t given enough time at Reading before we took a chance on him in 2010. Potter’s side are trying to play out from the back. It’s still very much a work in progress as we can put ourselves under needless pressure in dangerous positions but Potter will persist with it and you’d expect it to improve and become more effective as the season goes on. With nine games now played – roughly 20% of the season complete, only this week are we seeing a true possession-based style of football as the stats below demonstrate. In only three games so far have we had more than 50% possession and barring the Bristol City home defeat, our two most recent games have seen the highest number of attempted passes. As well as that, in the last two games we’ve succeeded 80% passing accuracy. 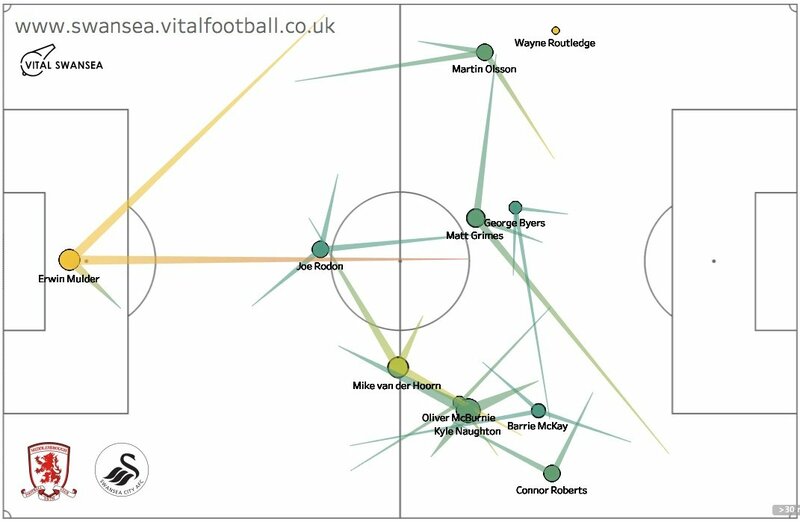 The passing network maps for Saturday’s goalless draw at Middlesbrough provides further evidence that Potter is looking to implement a more patient style of football. Up until this week, we’ve been rather direct in our attacking style. We’ve used pacey players like McKay and Dan James to hit direct balls to counter-attack and get in behind opposition defences but at Stoke and Middlesbrough, we saw a more patient approach. Graham Potter has been very flexible with his tactics, adjusting and tweaking them to suit the opposition. Is he now looking to establish a more consistent style of play now that we seem to have established and nailed down a very solid defensive structure? The average pass map for the first half against Middlesbrough shows our most compact passing shape of the season so far. The length of the passes are generally much shorter than we’ve seen in previous pass maps and there’s no clear outball option in a high and wide average position. Potter has recently adopted a 4-4-2 double-six system, or a 4-2-2-2 with a narrower midfield than we’ve seen before – relying more on the full backs for attacking width. McBurnie again drops deep into midfield level with George Byers with Routledge and McKay pushing further forward. The players are very close together allowing them to keep the ball and link passes together easier. As a result, the Swans had 65% possession in the first half and twice as many passes as Middlesbrough with 207 accurate passes. The attacking pass map below shows how the system evolves as the team move up the pitch and make passes higher up the pitch. 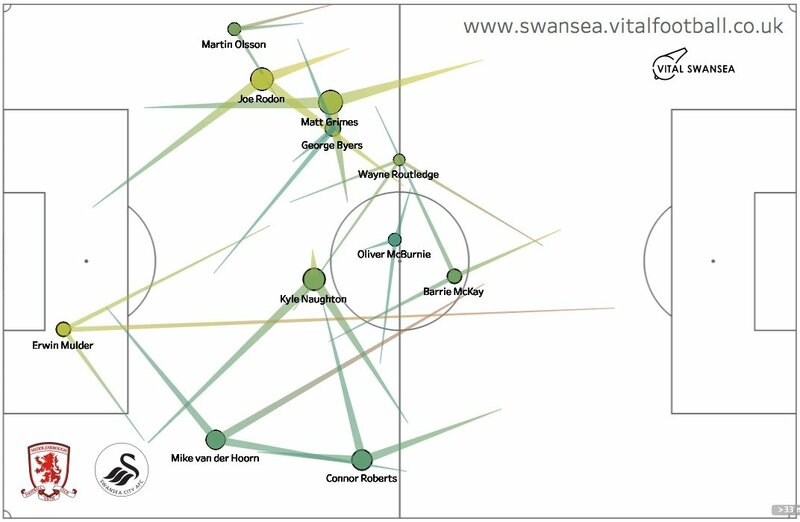 McKay and Routledge move into wider positions to support the full backs but an on-going concern here is to see McBurnie shifting out wide but you’d prefer to see him more central and playing in front of George Byers. 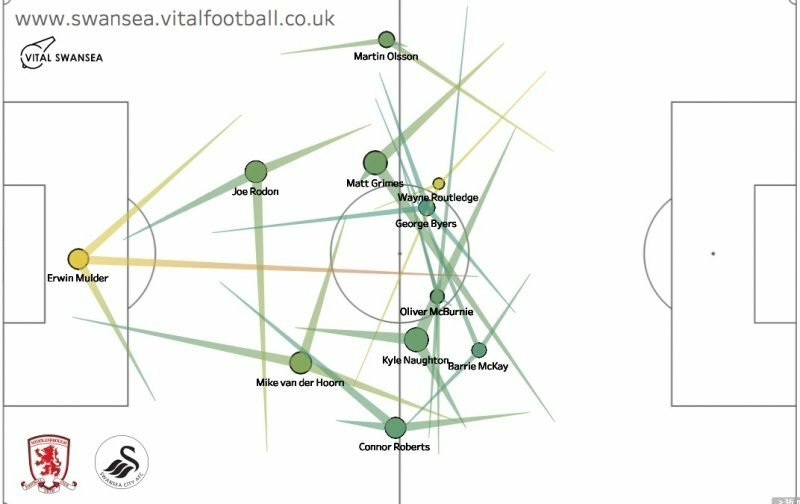 The defensive phase pass map below shows Swansea’s passing in the defensive, early build-up phase and we can see again how Routledge and McKay both move inside before drifting wide as the team move into the opposition’s half. The passes are, in general, shorter than what we’ve seen before. 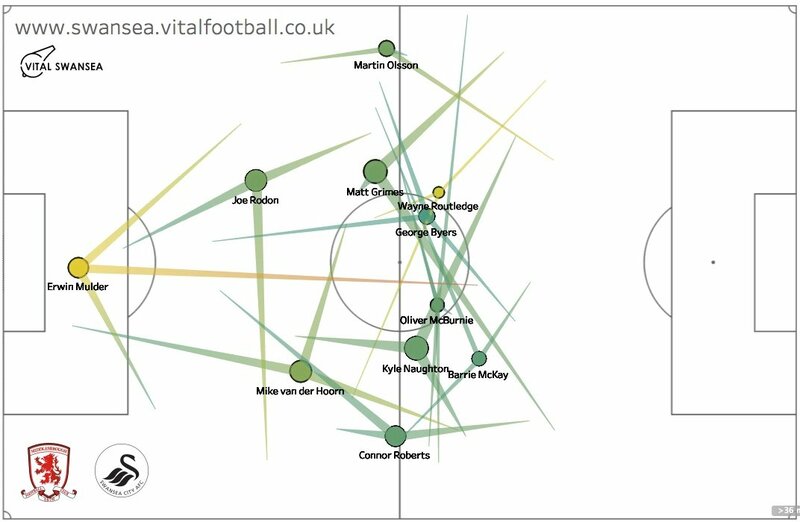 Olsson has been known to play a lot of long balls up the line but we didn’t see that this weekend. Our possession and passing accuracy % have significantly improved in our two last games. Now we have second best defence in the Championship and we are a passing team again. The last piece in the puzzle is much needed improvement of our attack. Yes, he is. There was an obvious change of style already in Stoke game. What we are witnessing right now is the second phase of Swans transformation back to Swanselona style of play.